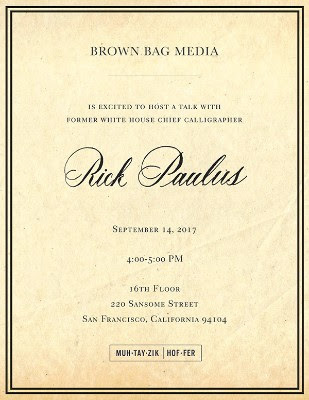 We’re excited to host former White House Chief Calligrapher, Rick Paulus, for a Brown Bag all about calligraphy this Thursday, September 14, at 4 pm. Rick served as chief calligrapher of The White House during the administrations of Bill Clinton and George W. Bush. If you’re in the neighborhood of 220 Sansome, come on by! The presentation starts at 4 pm. Drinks will be served. Special thanks to M/H’s chief calligrapher, Edward de Leon, for making the introduction.